Enter our 2nd annual Charity Golf Tournament at Golden Ocala by clicking on the image above for your chance to win! 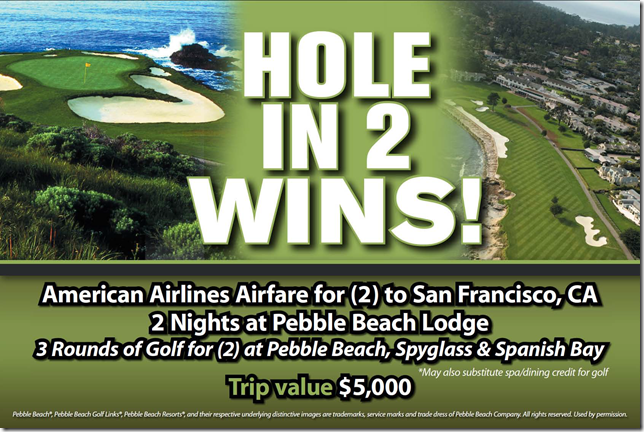 Be the first to make a HOLE IN 2 during our MTRA Charity Golf Tournament on February 26th, 2018 at the prestigious Golden Ocala Golf & Equestrian Club and you’ll win American Airlines airfare for two to San Francisco, CA, two nights at Pebble Beach Lodge, three rounds of Golf for Two at Pebble Beach, Spyglass & Spanish Bay! This incredible trip is valued at $5,000 and you may substitute spa and dining credit for golf if you prefer. Deadline for entries is Friday, February 16th at 5:00 pm and the event begins with a Putting Contest at 8:30 am. So get your game on!